Silas Bradley was born in North Haven, CT. At the age of 20, he came to Auburn and established himself as a merchant. He married Jane Loomis of Auburn in 1841. The Bradleys had two children, a son, Henry, born in 1848, and a daughter, Clara born in 1854. Both children predeceased their father. The family home was at 200 Genesee Street. After Mr. Bradley's death, Mrs. Bradley continued to live there until her death in 1890. 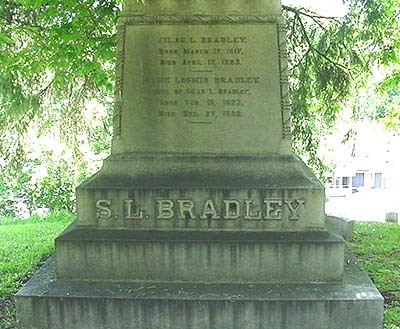 Silas Bradley was a member of the Fort Hill Cemetery Board of Trustees from 1855 to 1858. The Bradley monument is located in the Cemetery's North Side section.